ST. LOUIS – Webster University is listed as one of the top universities in the country that awards the most master’s degrees to Hispanic students, according to a new analysis from the magazine Diverse Issues in Higher Education. The analysis of how many degrees are awarded to Hispanics was published in the Sept. 24 issue of the magazine. While Webster University has been listed by Diverse Issues in Higher Education as among top-ranked universities for minorities in general, this is the first time Webster has been listed in rankings that focus on Hispanic students. Roach added that Webster University has been looking at its Hispanic enrollment numbers and looking at ways to improve outreach to those communities. For example, she said, Webster University recently joined the Hispanic Chamber of Commerce as part of an effort to collaborate with Hispanic business owners on educational programs. Diverse Issues in Higher Education ranked the number of Hispanic students who successfully completed degrees in undergraduate and graduate programs in the following four areas: Business, Management, Marketing and Related Support Services; Education; Engineering; and Social Sciences. The findings were extracted from data from the 2013-2014 U.S. Department of Education’s National Center for Education Statistics’ Integrated Postsecondary Education Data Set, the magazine said. According to the analysis, Webster University awarded the fourth highest number of master’s degrees in business, management, marketing and related fields in 2013-2014, ranking below Nova Southeastern University, University of Phoenix-Arizona and Florida International University. Webster University also awarded the 13th highest number of master’s degrees in social sciences to Hispanic students in the country that year, tying with Texas A&M University and ranking just below Queens College (Central University of New York), University of California in San Diego and Florida State University. 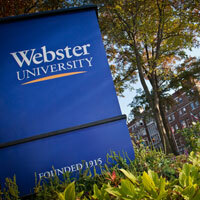 This is not the first time Webster University has been recognized for diversity. Webster is recognized nationally for providing an environment in which diverse students can be successful and earn degrees. Webster has consistently achieved top rankings in the Diverse Issues in Higher Education’s “Top 100 Degree Producers” survey since it was first published in 1991. U.S. News & World Report also has recognized Webster University for having one of the most “economically diverse” student populations in the United States.